“That’s a Bluetooth speaker? That looks so cool,” was the first thing my wife said when she saw the Marshall on our counter-top. 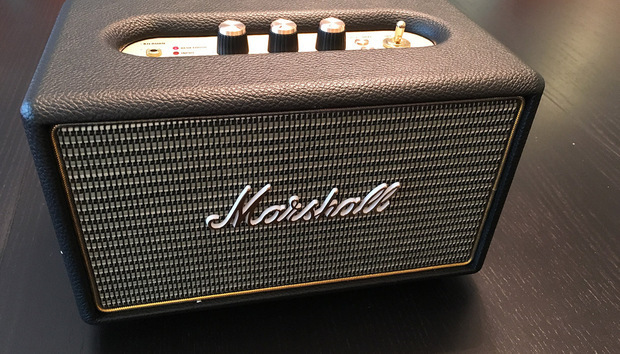 Of the half-dozen or so Bluetooth speakers I’ve had in for review over the past several months, none have struck up as much conversation as the Marshall Kilburn. The only other speaker I’ve had in for review that’s garnered as much attention has been MartinLogan’s sleek Crescendo. Fans of Marshall guitar amps will want to know, however, that the company behind the famous Marshall Stack doesn’t actually build this speaker. The amplifier manufacturer licensed its brand to a third party, Zound Industries, the Swedish company behind Urbanears headphones. But that doesn’t take away from the Marshall Kilburn’s ability to command your attention. It’s old-school style is both retro and edgy. Lifting the Kilburn, you’re immediately taken by it’s density. Something can feel heavy but not be dense. The Kilburn feels totally solid, like the analog amplifier head unit it resembles. That bulk makes the included imitation leather strap, which has a smooth velour underside, all the more useful. The strap attaches to each side with brass-colored buckles and a prominent hex-key rounded screw. There’s nothing dainty or understated about the Kulburn. Give the Kilburn an evening gown to wear and it’ll come out of the dressing room wearing leather combat boots. The Marshall Kilburn’s rotary knobs and toggle power switch add to the speaker’s vintage flair. The speaker’s main controls, located on the top, protrude from a brushed, gold-colored face plate recessed in thick, imitation leather that hugs the Kilburn’s circumference. Smooth-operating rotary knobs adjust volume, bass, and treble. The latter two are an endangered species on modern portable speakers. An old-school toggle switch turns the unit on and off. An audible “click” lets you know the control is engaged. Capacitive touch controls have no place here. Even the slightly protruding buttons for source selection and Bluetooth pairing give you both a tactile and audible cue that the Kilburn has granted your desire. The design is straightforward, unmistakable, and gets the job done immediately. There are no hierarchical menus, no multiple taps, and no frills. I love it. The Kilburn is a rear-ported design with two 3/4-inch dome tweeters and a single, four-inch woofer crossed at 4200Hz. The drivers are powered by Class D amplifiers and the system’s stated frequency range is 62Hz to 20KHz. The Kilburn’s rechargeable battery boasts a strong 20 hours of run time if you’re using it at 50 percent volume. Bluetooth 4.0 and a 3.5mm input are the only two options for feeding this vintage-styled speaker, but there is no aptX support. There’s also no companion app, so you don’t get the added features of stereo pairing, EQ, or other enhancements that a few of the competing Bluetooth speakers in this price range offer. The velour-lined strap is slick and stylish. The Kilburn has rubber feet that elevate the speaker about a half-inch and do a good job of isolating the cabinet from whatever surface you place it on. The feet could also be a lifesaver should you spill something next to the speaker, as it’s not rated for water resistance. I don’t know quite why, but I liked this speaker despite the many reasons I shouldn’t. It is by no means the best-sounding Bluetooth speaker I’ve auditioned lately; it’s certainly not the most accurate. It exhibits a consistently two-dimensional, flat sound with restrained dynamics and off-axis coloration. Despite all of that, I found it fun to listen to every time I turned it on. Its vintage look is matched by an uncommonly vintage sound, reminding you that music is an experience. Bass lines were smooth and sounded just right. Played through a Pioneer XDP-100R digital audio player, the 192kHz/24-bit FLAC version of The Police’s classic cut, “Every Breath You Take,” from Synchronicity, and the 48kHz/24-bit FLAC version of Meghan Trainor’s “All about that Bass,” from her album Title, served up classic examples. (Bluetooth speakers don’t stream high-res bitstreams, they down-sample them, so don’t let the source material confuse you.) Both songs were smooth and balanced, neither too punchy nor too reserved. Sure, the Kilburn doesn’t have the same “thwap” that the Oppo Sonica, Bose Soundlink III or JBL Xtreme do, but oddly I never longed for it either. The Kilburn presents bass notes as foundational musical elements, as opposed to making bass become that guy who needs to be the center of attention at every party. You can control both bass and treble on the unit—a feature that you don’t often see in powered speakers. During my listening sessions, I also noted that the Kilburn never over-emphasized a piano’s or a guitar’s body, as some other Bluetooth speakers tend to do. Over-emphasizing an instrument’s body may initially give a euphonic impression, but it gets fatiguing very quickly. For example, the guitar on Simon & Garfunkel’s “The Boxer” always knew its place. Playing the MQA version of “Lush Life,” from Lady Gaga's and Tony Bennett’s Cheek to Cheek, the Kilburn didn't reproduce the song with pristine accuracy, but it did capture its emotion. For example, the accompanying piano’s high notes were a bit syrupy without the characteristic crispness striking the ivory keys produces. Cymbals likewise took a polite back seat on the sound stage. Nevertheless, I found myself surprisingly engaged with the music playing in the background even though it exhibited a clearly boxy sound. Rocking to Tom Petty’s “Here Comes My Girl” or jazzing it down to Grover Washington Jr’s “Winelight” showed that the Marshall loved these genres. The saxophone in “Winelight” was smooth and warm even though it gave ground on the top end. While the Kilburn is a rear-ported design, placing it right against a wall surprisingly didn’t turn bass lines into a muddy, boomy mess. The Kilburn is a rear-ported design. If you’re wondering how the Kilburn would play at a party or outdoors, you’ll be happy to know it will get along pretty well, but it won’t top our best performers in this category. It didn’t quite get to the same ear-bursting levels that the UE Megaboom or JBL Xtreme could reach. I also wouldn’t recommend cranking up both the source and the Kilburn to max at the same time. If you do, this speaker will get a bit harsh. While you could argue that’s vintage sound, that’s the one aspect of vintage I can do without. If you like your music and and your gear old style, you will simply fall in love with the Marshall Kilburn. It’s a smart, spunky speaker with plenty of attitude. The audiophile in me won’t use this speaker for reference and, from a purist point of view, the Kilburn has its sonic shortcomings. But you know what? The Kilburn doesn’t care. It simply rocks, on its own terms. Whether you’ll find those terms acceptable is a different story.